It wasn't just the US election result causing upset among COP22 participants on Wednesday. Matt Wright highlights a slick new way of sharing data, creating a stir at this year's climate negotiations. Donald Trump's election as the United States' next president brought a decidedly subdued atmosphere to the UN climate talks here in Marrakech: a man who has called climate change a "hoax" and pledged to withdraw the US from the Paris Agreement is set to be the world's most powerful politician. In conversations at breakfast tables, on buses ferrying participants to the Blue Zone and in the security queues, Trump's election dominated. The morning following the shock result, the US negotiating delegation strode through the COP22 complex with barely a sideways glance. It was reminiscent of a football team preparing for a big match, or a celebrity trying to deflect a scandal – no questions please, no distractions; we're all business here. Perhaps they wanted to set the tone of how the US will continue as a leader in the fight against climate change under a Trump presidency, as IIED director Andrew Norton later called for. These discussions – hushed, disbelieving, and with plenty of head-shaking – continued into the COP22 exhibition hall where organisations, including IIED, are showcasing their work. But here the Trump election wasn't the day's only drama. 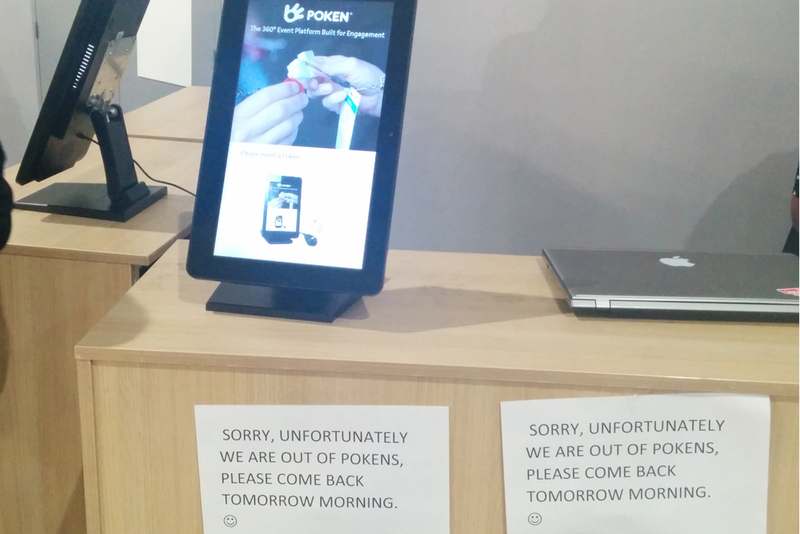 There was an added frisson: the Poken stand had run out of devices. (Click on the smaller images to expand them and open a photo gallery). Poken is a 'touch-and-collect' system enabling participants to easily collect digital information, such as publications, videos or links to websites, at large events. "Gotta catch 'em all!" runs the Pokémon tagline, and going by the queues at the Poken stand, it seems COP22 participants have the same idea, all wanting to gather as much information as they can. 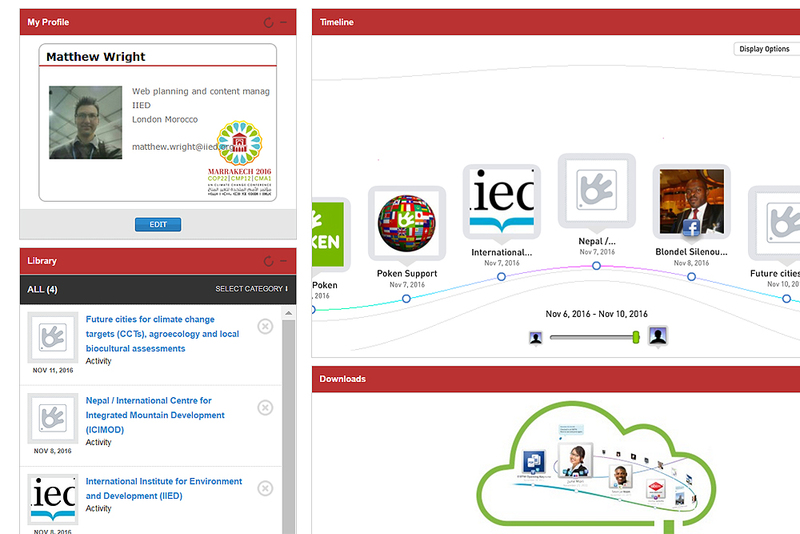 Organisations upload data to Poken's website portal, and are given a hub for their exhibition stand. Individuals can then sign up to receive a personal Poken fob, and when this is touched against the hub, all the data hosted on the website is automatically transferred. 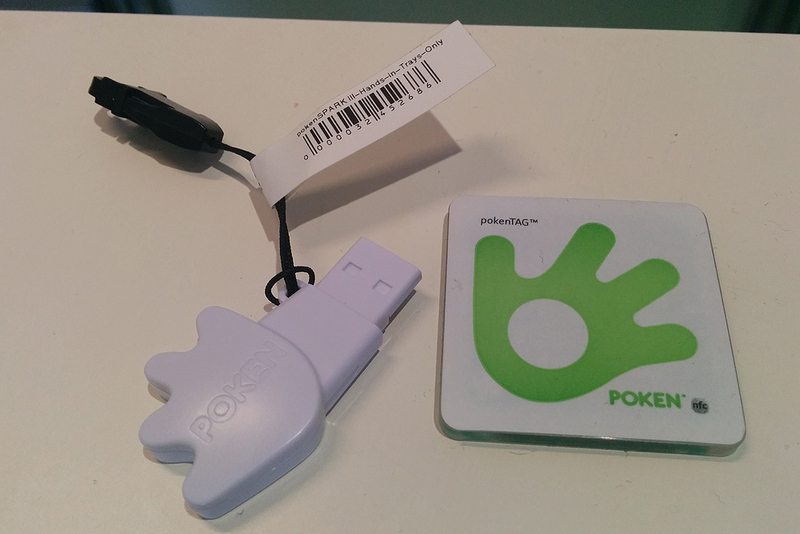 The fob also acts as a memory stick, or users can simply log in to their account on the Poken website to access the information they have collected. This is part of the UNFCCC's efforts to reduce paper distribution at the convention. 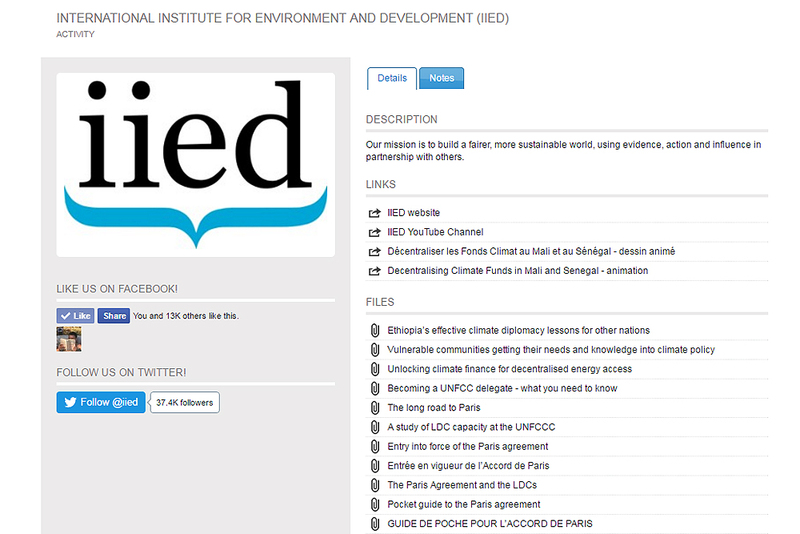 IIED takes such issues seriously, as our environmental policy shows: in advocating sustainability we commit to living out sustainable methods ourselves. Schemes such as Poken, and even the simple USB stick, offer easy alternatives to the paper-heavy. To this year's COP, we have brought substantially fewer briefings, working papers and other paper publications. And significantly, this is the first convention since we upgraded our Publications Library to improve usability and download speeds. The new super-fast page load speed of the Publications Library, also enabling rapid downloads, is a major improvement and proved even more essential given the sometimes unreliable Wi-Fi at the COP22 venue. Meanwhile, the live search facility makes it easy for visitors to find and download key publications, such as 'Becoming a UNFCCC delegate: what you need to know', our most popular publication this week by far. Poken has been a big success at COP22. The IIED stand recorded several hundred exchanges of data via the system in the first few days. 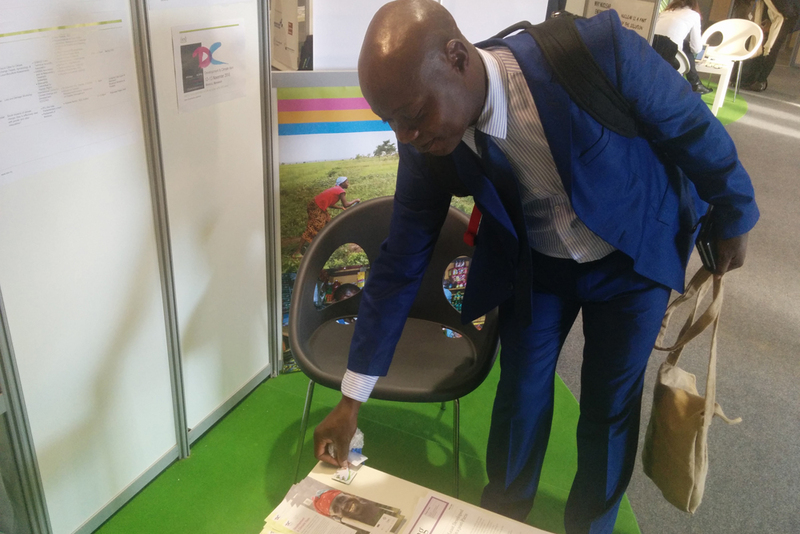 And because everyone who has a Poken must register their personal information, it's also been a great way for IIED to get instant, detailed information about who has accessed our research via our stand, opening up opportunities for us to learn more about audiences interested in our work. It's not all positive, though. Monitoring and evaluation is crucial for understanding our work's impact, and it would be useful to know which publications are actually accessed and read. A further side effect is that visitors have less incentive to interact with an organisation's representatives at the stand. An exhibition space is all about human contact and making personal connections. But with Poken, people can turn up, press their fob to the device and leave without uttering a word. That said, this exchange of data, including contact information, means there's still opportunity to build relationships. A Poken 'touch' could be the first step that leads to new partnerships of tomorrow. 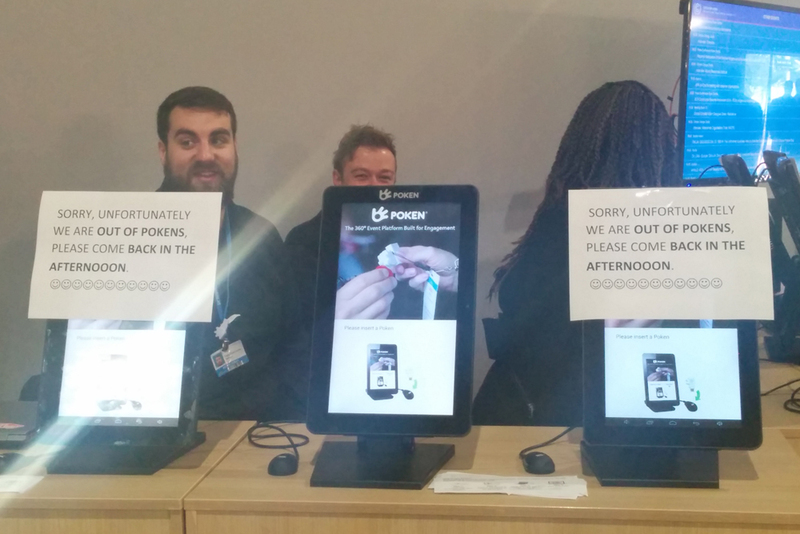 And ultimately, when you catch a glimpse of the poor, neglected, QR codes that the UNFCCC obliges every stand to include, the touch-and-collect system is a huge improvement. Back to Trump, it remains to be seen how his policies will impact the global drive to take climate action, and the same applies to technology. As we move further into an era of digital diplomacy, COP22 has seen a surge in the use of mobile devices. Free mobile messaging apps such as WhatsApp have long been used to arrange meetings or interviews, such as with the Least Developed Countries Group chair Tosi Mpanu-Mpanu, from the Democratic Republic of Congo, carried on the Climate Home live blog when he said of Trump's election: "I can only be positive and optimistic". But now we're hearing WhatsApp is being used by actual negotiators discussing their tactics in a restricted group. Why break off from a negotiation to have a huddle, when by using WhatsApp you can gain that privacy in a virtual huddle right where you are? What happens next, we wait to see. Matt Wright (matthew.wright@iied.org) is web planning and content manager in IIED's Communications Group.